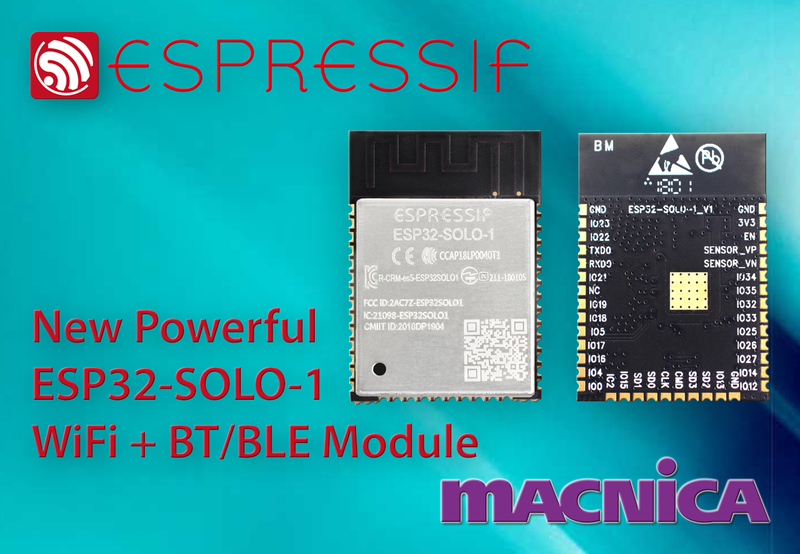 ESP32-SOLO-1 is a powerful wireless module combining Wi-Fi and Bluetooth (classic and low-energy) connectivity. ESP32-SOLO-1 is suitable for a wide variety of applications, ranging from low-power sensor networks to voice encoding, music streaming and MP3 decoding. At the core of this module is the ESP32-S0WD chip, which is a member of the ESP32 series of chips. ESP32-S0WD has a single core, although it is still capable of getting connected to all the peripherals of its dual-core counterparts. ESP32-S0WD offers great value for money, having a highly stable performance in various complex IoT applications. The combination of Wi-Fi with Classic and Low Energy Bluetooth ensures unparalleled connectivity in different application scenarios. Wi-Fi enables internet connec-tivity over a large area, while Classic Bluetooth allows users to securely connect ESP32-SOLO-1 to their mobile phones for exchanging data over short distances by using short-wavelength UHF radio waves. Additionally, ESP32-SOLO-1 can func-tion as a beacon, broadcasting its identifier via Bluetooth Low Energy to portable electronic devices within a maximum radius of 50 meters. The sleep current of the core chip in ESP32-SOLO-1 is less than 5 μA, which makes the module suitable for battery-powered applications and wearable electronics. The module supports data transfer at 150 Mbps, while having an output power of 20.5 dBm at the antenna. Several peripherals facilitate integration with other electronic devices, thus offering industry-leading specifications and great performance. Espressif Systems (Shanghai) Pte. Ltd. is a fabless semiconductor company, with headquarters in Shanghai Zhangjiang High-Tech Park, providing low power Wi-Fi and Bluetooth SoCs and wireless solutions for the Internet of Things (IoT).Espressif ESP32-Wrover-Kit The company build the widely popular ESP8266 and ESP32 chips with an innovative team of chip-design specialists, software and firmware developers and marketers. Espressif is committed to providing the best IoT devices and software platforms in industry. The company also helps their customers build their own solutions and connect with other partners in the IoT ecosystem. Their passion lies in creating state-of-the-art chipsets and enabling partners to deliver great prod-ucts. Espressif’s products are widely deployed in the tablet, OTT boxes, cameras, and Internet of Things markets. For more information see http://www.espressif.com.